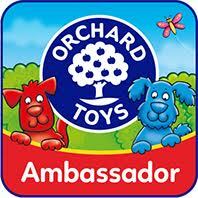 One of my favourite blogger roles is being an ambassador for Orchard Toys. Caterpillar is game obsessed. 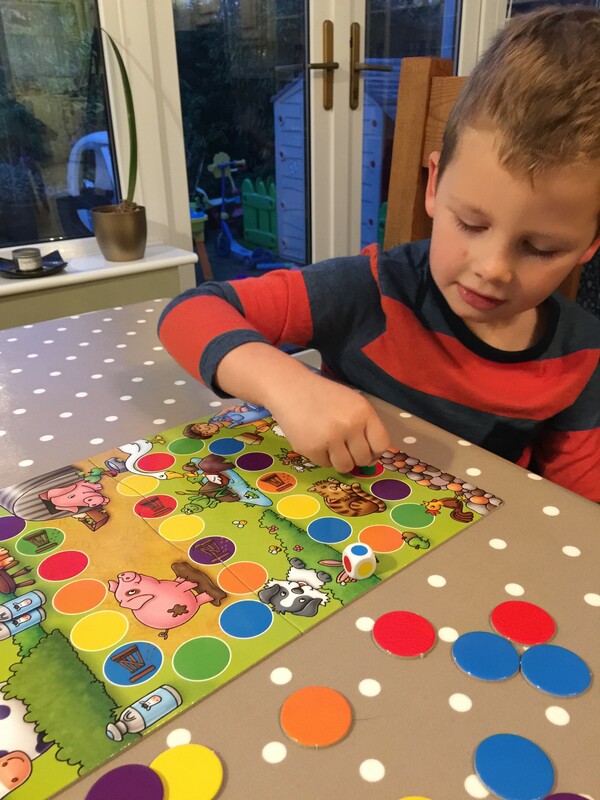 He chooses a board game over almost any other toy or activity and so far we’ve reviewed some fantastic ones from Orchard (links below). However, this is the first time they’ve combined some of their favourites into a Games Compendium. This is such a fantastic idea and would make a brilliant Christmas present. The games in the set are all amended versions of their existing best sellers so it would be great for anyone looking to be introduced to the brand. Our favourite of the four is the Old MacDonald Game. 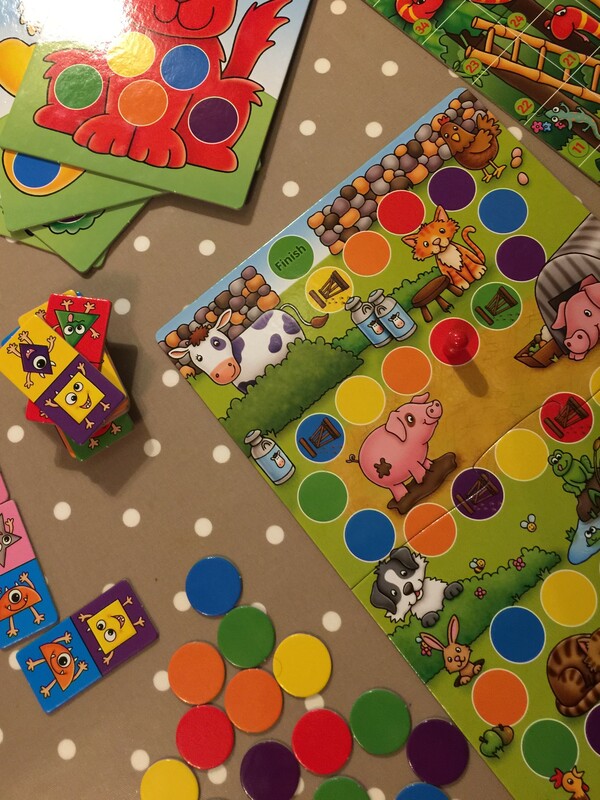 Set on a farm, this is a boardgame with a difference. Instead of moving a certain number of steps with each roll of the dice, you actually move to a particular colour instead. This means it’s great for slightly younger children who haven’t yet learnt to count. When you land on each spot you select a token of that colour and add to your collection without turning it over. If you land on a gate you have to return a token to the pile (but there aren’t too many gates, which will be a relief to anyone who has a sore loser child like I do!). Once the first player reaches the finish line all players turn over their tokens to reveal pictures of animals on the other side. Some tokens have three animals and others have less. 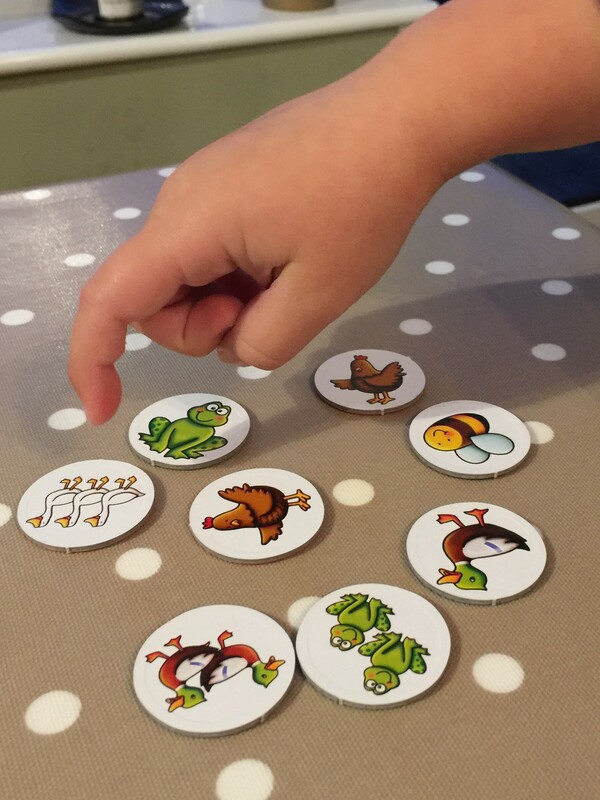 Similar to Cheeky Monkeys (probably our all time favourite Orchard Toys game) the winner is the person with the most animals, not the most tokens or who finishes first. I love this idea as it adds another level of interest and excitement to the game. The other games in the set include Monster Dominos, Snakes & Ladders and the Red Dog Colour Game. The latter is similar to Dotty Dinosaurs and again a colour matching game perfect for preschoolers. With their bold monster shape designs and bright colours this is a fun version of the classic that you could easily slip into a sandwich bag and take with you on journeys or to visit family or friends. Jungle Snakes & Ladders is beautifully designed with lots to capture your child’s attention and a great way to teach them about the ups and downs of playing games and the concepts of winning and losing (which, as I mentioned, is definitely something my son needs to learn about at the moment). As usual, at £15.95 for four games in one the price is fantastic. A great addition to any stocking. Would you like to try the Orchard Toys Games Compendium for yourself? Simply enter the giveaway below for a chance to win. would be great for my niece and nefew as a Christmas gift. This would make such a great gift for my daughter, she also loves board games and has a pile in her bedroom! This would make such a great Christmas gift for my two daughters who have a few Orchard toy sets! I love Orchard Toys games, they have such a good range – great to see a compendium at last! Great giveaway my granddaughter would have fun playing these. Already commented on the comp, now closed, with the link provided. Thanks for this one. Orchard games are always good fun. 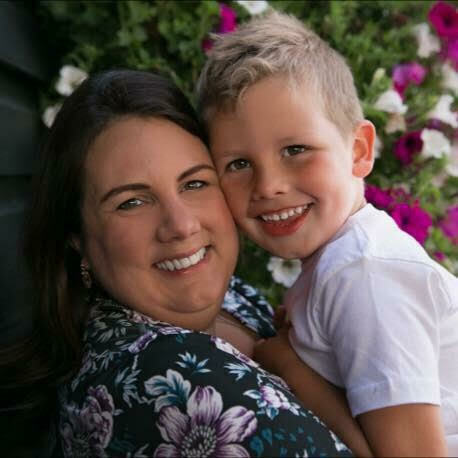 Would love to play with my son- thanks! Orchard Toys games are great! My kids would love this fab prize. This would be fun to play together! My family would love this prize!